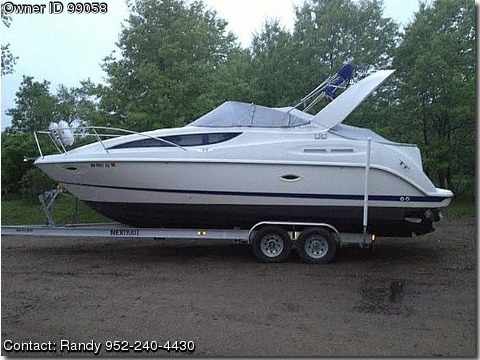 Please call boat owner Randy at 952-240- four four three zero. Boat is located in Inver Grove Heights, Minnesota. Mercruiser 7.4L, V8, 310 HP Bravo III outdrive with less than 300 hours. Sleeps 6, aft cabin with full size bed. Galley has electric stove, microwave, and bathroom. Includes, heat, AC, AM-FM CD player, TV/DVD, compass, anchor, depth finder, shore power inlets, cockpit table, swimming ladder. Newer Sunbrella Tonneau cover and Full Cockpit enclosure Bimini Top-Royal Blue with full glass and screen - purchased in 2010. New bottom paint and stripe. Boat has only been in fresh water and stored indoors in the winter. Professionally winterized annually. 2010 Nextrail Aluminum dual axle 10K trailer with electric brakes. Willing to sell boat and trailer separately.